During Owen Paterson’s vocal conversation with David Cameron in defence of his record as Environment Minister after learning he was being sacked, Paterson reportedly said: ‘this will be a kick in the teeth to 12 million countryside voters… you are making a big mistake’. There is already mounting evidence to suggest Paterson could be right. Judging by the two standing ovations that Paterson went on to receive last Friday at the Game Fair at Blenheim Palace (at the mere mention of his name), Charles Moore commented that ‘you could almost see the disaffected Tory voters fleeing to Ukip across the tent’. Never one to miss an open goal, Farage (mobbed at every beer tent and bar dressed in the sort of white striped English blazer jacket I had last seen at Henley in the 1980s) could not resist adding a public eulogy to Paterson for his record of not only being the only minister who truly ‘understood’ the countryside but also – and perhaps more importantly – having been the only minister brave enough to stand up to the powerful (tax payer funded) ‘Green Blob’ lobby, with its zealot army of climate change activists, lobbyists and anti-countryside fundamentalists. Farage makes no apology for enjoying his shooting and other country pursuits including long pub lunches. That Cameron was himself absent from the Game Fair says much about his worrying indifference to the numbers of traditional Tory rural voters now defecting to Ukip. The Game Fair represents the land, property, sporting and ‘lifestyle’ farming interests of some 12 million potential voters – not just landowners and Argyll-welly wearing members of the CLA (Country Land and Business Association), whose deputy Ross Murray debated against Nigel Farage on the subject of ‘Would the countryside be better off if we left the EU?’. From the amount of ‘hear, hears’ and cheering that met Farage’s answers, it was pretty clear that Cameron now has every reason to be worried that he is in danger of losing his all-important rural voters. That Cameron chose not to appear at the ‘Glastonbury’-style celebration of the countryside – with Blenheim being only a bike ride away from from his own Oxfordshire constituency – needs also to be understood in the context of his appointment of Liz Truss, the Leeds born 38-year-old woman Cameron has promoted to take over from Paterson. The two could not be from more different backgrounds. Owen Paterson (MP for North Shropshire) was born in Shropshire, where I also live, and is known as a true ‘countryman’, who also speaks good German and French. His business background is in the leather industry and he is an accomplished horseman (not just hacking across the local countryside a la Cameron but also across Mongolia) whose wife Rose is an establishment figure in racing (previously at Sotheby’s) and runs Aintree race course. That Rose is also the Northumberland-raised daughter of the late Viscount Ridley makes the Patersons a formidable and popular rural political couple not only in the Midlands but across the country. Liz Truss on the other hand was brought up in Leeds, marched with CND as a teenager and was president of the Lib Dems at Oxford after which she worked for Shell – of all companies. Whilst many in the shires are relieved to hear she is sound on the rural blight of solar farms, her appointment has not inspired much confidence that Cameron is focusing on the traditional countryside vote come May 2015. This is not only worrying but misplaced. Whilst the media talked about the reshuffle being a Tory ‘de-tox’, the reality is that it was really another Cameron ‘de-toff’ exercise. Other well-educated and highly competent ministers who were axed include former Guards officer Hugo Robertson and Old Etonian Nick Hurd – son of Lord Hurd. The truth is that it is not just the rural classes that feel abandoned and betrayed by Cameron, it is his own class; and the bad news – as shown by Farage being given rock star status at the Game Fair – is that these traditional Tory-voting upper-class voters are now defecting to Ukip in ever-increasing numbers. For example I was recently walking my wife’s pug along St Leonard’s Terrace in Chelsea – one of Chelsea’s most expensive streets – when I noticed not one but two purple ‘Vote UKIP’ car stickers (featuring a sterling pound sign) parked separately in resident bays along the street. Judging by the amount of dog hair in both cars – a VW golf and a Mercedes estate – both looked as if they belonged to Chelsea residents with a nice pile in the country. I had a similar experience in the Royal Enclosure car park at Ascot in June where I noticed several more ‘Vote UKIP’ car stickers. 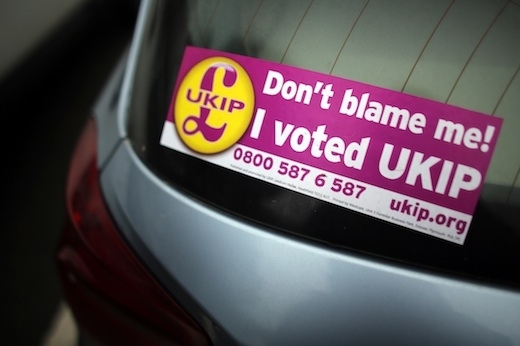 Should Cameron and his advisors be worrying about a few purple toff car stickers? The truth is that ever-increasing numbers of rural voters (from all classes) are now coming out of the country closet and defecting away from the two party system. Whilst Cameron wouldn’t be seen dead today picnicking in his tail coat at Royal Ascot in the style of the county gentry class that he was born into, there are deep concerns in the shires over the Coalition’s seeming indifference to countryside issues – most particular in regards to planning. Osborne and Cameron seem to think that the growing economy is the trump card that will win them the election and ensure that Tory voters do not defect to Farage. Indeed, Cameron told a mutual friend at dinner the other night that the Ukip vote ‘will come back’ because of the economy. But this misses the whole point of why people – like myself – choose to live in the countryside. We live in the countryside not for economic reasons but for aesthetic reasons – for the ‘quality of life’ that goes with unspoilt countryside, such as around the South Shropshire Hills of AE Housman fame, which are now under daily siege from developers, whether it is solar farms, Polish-style industrial pig farms, social housing or wind farms. People don’t vote Tory because they can buy a bag of local vegetables at Bridgnorth market for under £5. They vote Tory because they want the mini Arcadias of their own countryside and homes and gardens – this ‘other Eden’ as Shakespeare put it – protected by the Tories. And nowhere is this being felt more keenly – in Shropshire at least – that in the gentry classes. Around my part of Shropshire near Morville, where I live in a state of civil war with the local ‘EU subsidy harvesting’ former tenant farmers (most of whom have bought their land in the last 20 years), at least four major country gentry types with ‘the Big House’ and estates are now out of the closet as Ukip supporters. Severing the traditional links between the Tories and the gentry could be a fatal mistake. The rural vote – especially around the East and West Midlands where Ukip performed especially well in the European elections – will be critical in 2015. With many Tory MPs clinging on nervously to majorities of fewer than 1,000 votes, the Tories simply cannot afford to alienate the Tory voting rural constituency. In Warwickshire North, Dan Byles MP, who yesterday announced he will stand down at the next election, has a Tory majority of just 54; in Wolverhampton SW (close to where I live) Paul Uppal has majority of just 694. The media have misunderstood the popular appeal of Ukip by focusing on the issues of immigration and the EU. Just as important a reason for defecting is the Tory betrayal of the rural and aristo classes – with Ukip now (proudly) seen as the pro-countryside and heritage party. Unless the Tories can placate this rural discontent – largely brought about by the planning wars that have seen the developers’ bulldozers parked on the village green – Ukip may continue its voting march across the Shires in 2015, regardless of Newark and Cameron’s bold and popular stance against Juncker becoming the next president of the EU Commission. For the Tories to win in 2015, they cannot afford to lose the ‘county’ vote. As seen at the European elections, Ukip voters don’t seem to be put off voting for gentry types. William, 10th Earl of Dartmouth, was re-elected as the Ukip MEP for the South West, where Ukip polled more than 50,000 votes than the Conservatives. ‘Support for Ukip is growing in the shires’ he told me. ‘Much of our appeal is from countryside voters who are disillusioned with the political establishment. Ukip appeals to all types of people. That includes landed types as well as blue collar voters and decaying aristocrats such as myself’. Dartmouth says he is far from being alone in being a Tory aristocrat disenchanted with Cameron’s ‘progressive’ brand of politics. Other prominent upper class figures who openly support Ukip include my friend the Mayfair club owner Robin Birley, whose wife Lucy has an estate near us in Shropshire, the food writer and historian Richard, Earl of Bradford, whose Shropshire family seat of Weston Park is thought to have inspired the Blandings novels of PG Wodehouse; the 13th Earl of Wemyss (better known as Jamie Neidpath), and Earl Bathurst who owns much of Cirencester. Lord Hesketh, the former Tory minister and former owner of the Baroque mansion Easton Neston, who was appointed the Ukip defence spokesman. ‘The trouble with the countryside is that most modern farmers don’t care about the countryside any more’, says Birley. ‘The countryside has been all but abandoned by the Coalition. Farmers and developers just want to get into whatever EU subsidy racket they can and the Tories don’t seem to be the countryside party any more. It is worrying as the English countryside – and the right for people to enjoy it – is one of our greatest assets’. Doubtless Lynton Crosby has run the polling numbers and may not be worried about losing the Tory support of a Mayfair club owner, some aristos and a few country gentry types. But the appeal of Ukip in the countryside (just drive around the Chilterns where HS2 will scar the Tory voting countryside) is now turning more openly middle-class and mainstream. The price of allowing Ukip to position itself as the ‘countryside party’ – traditionally the Tory’s political terroir – is certainly more worrying. Ukip are appealing not only to stately home owners who now can’t afford to do repairs on their country piles (many of which are open to the public and help to contribute £16 billion to the economy) but also those farm labourers and rural workers who see their jobs threatened by an influx of cheap European labour. This is especially the case in the West Midlands, where many Romanians and Bulgarians have converged on Birmingham, making certain parts of the city now resemble a Romanian refugee benefits camp. At the the 2010 election, Ukip votes cost the Tories seats in constituencies in Dudley North, Walsall North and Walsall South. In 2015, the seats lost is only likely to rise. It may not be the most scientific of polls, but judging by the increased numbers of purple and yellow Ukip car stickers I have seen this season in our Upton Cressett visitor car park (our house and gardens are open to the public on weekends in the summer), it looks like the National Trust and Pevsner carrying-classes (often Lib Dem or Labour) are also defecting to Ukip. If the Tory party can’t even get the votes of the Hudson’s guide-carrying, ‘Tours, Teas and Toilets’ brigade then they really haven’t got much hope of winning the election. As the chairman of our local campaign group to preserve the countryside of the South Shropshire Hills from wind turbine desecration – a rich farmer with a Cardinal Richelieu moustache called Millington wants to erect two 80m turbines less than 1600m from our Grade 1 Elizabethan gatehouse despite formal objection from English Heritage – many in our campaigning ranks (traditional Tory voters) have declared a sympathy towards Ukip in terms of being the pro-countryside and anti-wind party. The reasons for this sympathy with Ukip has little to do with concerns over immigration, but everything to do with protecting the countryside, Green Belt and our national heritage. The ‘Paradise of England’ (as Wodehouse described Shropshire) into which they have sunk their life savings in the hope of living the English rural dream is now under daily threat from developers and pro-build planning policies from minsters like Nick Boles whose ‘Let’s Build’ edicts are seen as a betrayal and abandonment of rural England. At the Olympics, Cameron announced he was spending £27 million marketing the UK heritage and tourism industry by splashing huge posters and videos around world airports proclaiming ‘Countryside is Great’ and ‘Heritage is Great”. Yet, judging by his recent tax targets, Osborne is no particular champion of the heritage industry despite ‘heritage and countryside’ regularly being listed as the principal reasons that visitors and foreign businesses are drawn to locating in the UK. But Osborne’s 2012 Budget decision to introduce VAT on repairs for historic and listed buildings – essential for the upkeep of houses open for tourism – has been devastating for owners. Such tax raids have deeply alienated not only the 1500 members of the Historic Houses Association but also the artisans and traditional brickies and stone masons who do most of this specialist conservation work. Yet developers who build new housing on Green Field land pay zero VAT. I have lost count of the number of traditional craftsmen that have been forced out of business as a result of having to charge an extra 20% to replace ornamental plaster-work or a crown brace beam. When I call up old suppliers I am told they are now driving a delivery truck or working as a contractor for a developer. Artisan workers such as skilled brick cutters (who can replicate 16th century diaper work) are the life-blood of communities. To have them working a fork lift truck in a warehouse in Telford is both tragic and risible. There are around 5,000 listed buildings in the UK – only around 2% are Grade 1. According to the HHA, the new 20% rate of VAT on repairs now poses ‘significant problems’ for the maintenance of Britain’s heritage sector, as well as putting skilled rural workers out of jobs. There is an inherent contradiction between the NPPF explicitly acknowledging the importance of finding an economically viable’ use for historic buildings and Osborne’s new anti-heritage VAT charge which puts ‘at risk’ (says the HHA) the future of our nation’s unique heritage. The national contribution of historic houses – culturally, socially and through education – is beyond measure to the UK economy. HHA member houses welcome over 13 million visitors a year. That is over 11 million more visitors than Jamaica receives every year. If Osborne is serious about keeping the Tory rural and historic house owning classes vote – already badly alienated enough by the political establishment after Blair kicked most out of the Lords – he should read the newly published HHA report called ‘Heritage Means Business’. Which brings me to another largely unspoken reason why so many of the landed or stately home owning classes may be attracted to UKIP. Many aristos – such as writer (Viscount) Matt Ridley, who happens to be Owen Paterson’s brother in law – would like the chance to sit in the Lords even if only as a working life peers. And after being disenfranchised by Blair, who culled the Lords, many (especially the sons of former hereditary peers who never even had the chance to take up their seats) are not especially fussy whether they wear their ermine under the Tory or Ukip whip. When a hereditary peer drops dead competition is intense (and politically cliquey) for the rare by-elections to be elected as one of the ’42’ Tory hereditary peers of the 90 allocated by Blair under the The House of Lords Act of 1999. Unless you have a high-profile name like Ridley, who was voted in last year as one of the 42, getting elected to the upper chamber is no easy task. As one fortysomething Earl said to me recently. ‘I’m not especially political but I’d happily become a Ukip working peer if that is the only way I can get into the Lords’. Farage recently re-affirmed his determination to get Cameron to appoint more Ukip life peers – in proportion to the number of electoral votes. The party currently has just three – Lord Pearson, Lord Stevens (former chairman of United Newspapers) and Lord Willoughby de Broke – all of whom are Tory party defectors. In an article written for Prospect magazine last year, Farage spoke of how under Cameron’s own ‘stated rules’ Ukip should be ‘due’ 24 peers out of the total of 790. Farage also said that he thought the old House of Lords ‘worked very well for centuries’ adding that a hereditary second chamber may be ‘an affront to the egalitarian mindset of the 21st century’ but the old Lords has acted as a far more ‘successful opposition than any official opposition in the Commons ever did. Whether dukes and aristocrats with their estates and armies of loyal estate workers and tenants will follow their local mi’lord – as in the Downton era – I cannot say. But historically estate workers (at least before the 1950s when we had a two party system) have travelled both religiously and politically in converting with the colour of the political smoke coming from the castle. With the aristocracy (many of whom are members of White’s – once chaired by Cameron’s late father) feeling as isolated, ignored and voiceless today as never before, it is hardly surprising than many are considering defecting across party borders. At the next party conference, Liz Truss will have to win over the rural vote like never before. Else Cameron may deeply regret losing Paterson. Is Mark Reckless set to become Ukip’s Head of Policy?